When someone signs up for a subscription on your network it’s the beginning of your relationship with them. Tailoring your email receipt is the perfect way to start a rapport. Here are some Vimeo OTT networks who have nailed setting up the perfect welcome message for their audiences. When customers first start viewing content on a new service they may not know where to start. Having well-organized collections certainly makes it easier. 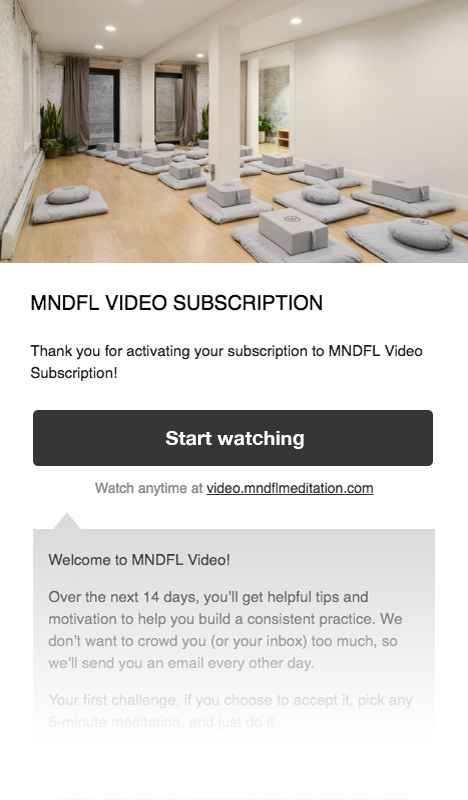 The team at MNDFL took simplifying where to begin a step further. In their email, they set up a getting started challenge to encourage their subscribers to dive into their videos without making it too overwhelming. Over the next 14 days, you’ll get helpful tips and motivation to help you build a consistent practice. We don’t want to crowd you (or your inbox) too much, so we’ll send you an email every other day. Your first challenge, if you choose to accept it, pick any 5-minute meditation, and just do it. Then, give yourself a high five. Finally, have fun, be kind to yourself and just stay open to whatever comes up. Feeling a connection to your content is what keeps subscribers renewing month after month. You can start nurturing that relationship from day one by customizing your email receipt message like Word on Fire has. 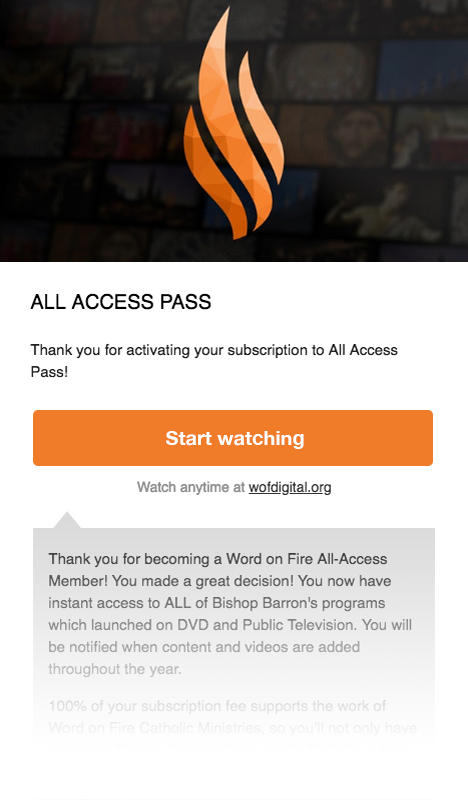 “Thank you for becoming a Word on Fire All-Access Member! You made a great decision! You now have instant access to ALL of Bishop Barron's programs which launched on DVD and Public Television. You will be notified when content and videos are added throughout the year. 100% of your subscription fee supports the work of Word on Fire Catholic Ministries, so you’ll not only have access to Bishop Barron’s high-quality Catholic videos, but also are directly promoting the work of evangelization. Understanding the needs of your audience can help you craft a message that will set them up for success. 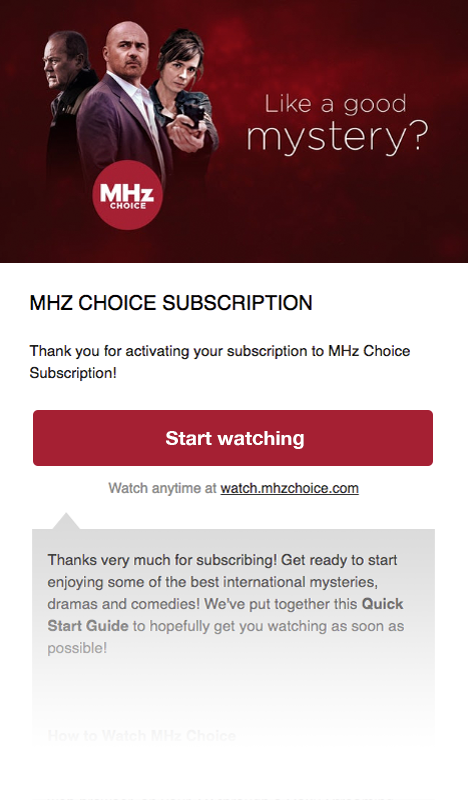 MHz Choice knew that a large segment of their customers were signing up for their first digital streaming platform when they subscribed so they wanted to make viewing their content as easy as possible. They include instructions for viewing their content for all of their branded apps. This helps make it easy for their subscribers to get set up and start watching right away. “Thanks very much for subscribing! Get ready to start enjoying some of the best international mysteries, dramas, and comedies! We've put together this Quick Start Guide to hopefully get you watching as soon as possible! You can watch MHz Choice online through your favorite web browser, on your TV through a Roku Streaming Player or with our iOS and Android apps. Click here for a list of supported devices. Are you brand new to MHz Choice? Check out What to Watch: A Newbies Guide to MHz Choice! MHz Choice Support Site- lots of useful information and tips! MHz Choice Contact Form-Got a question not found on our support site? Drop us a line here! We're so thrilled you've subscribed and if you have any questions for us, we'd be happy to help! Click here to drop us a line. Subscriptions are a unique product. Your customers aren’t just looking to view your content. Often they are just as excited about being part of the greater community that you are building. If you have an active facebook group, are using the forums tool, or have other ways you connect with your followers it can help your new subscribers feel like they are now part of your in crowd. Dekkoo has done that brilliantly in their email. “Thank you for subscribing to Dekkoo.com! We know you're going to love our collection of entertainment for gay men. New titles are added every Tuesday, Wednesday and Thursday so be sure to check back often! In addition, be sure to visit http://www.dekkoo.blog where we discuss gay film and spotlight titles available on the Dekkoo streaming platform. Thanks again and welcome to Dekkoo! Kids content is one of the fasting growing genres of subscription networks. While children may be the viewers their parents are the ones purchasing. One4Kids has a message to the guardians who are buying subscriptions for their kids to let them know how the platform works and their core values. Thank you so much for subscribing to our channel. It means a lot to us. 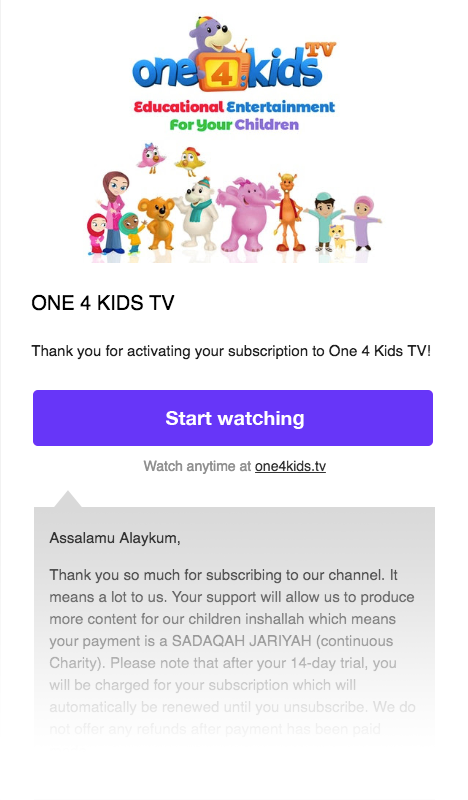 Your support will allow us to produce more content for our children inshallah which means your payment is a SADAQAH JARIYAH (continuous Charity). Please note that after your 14-day trial, you will be charged for your subscription which will automatically be renewed until you unsubscribe. We do not offer any refunds after payment has been paid made. Our children are spending 3 – 6 hours a day watching all sorts of media and playing games. Imagine if those hours are spent watching films that will bring them closer to Allah and make them better Muslims inshallah. Films about the great stories of the Prophets and Companions or an Islamic animation series similar, but better than Peppa Pig that will instill in our children the beautiful manners and character of our beloved Prophet Muhammad (saws). We know our quality is not up to the Disney standard yet and Allah knows we are trying very hard to catch up to them and inshallah with your support we can achieve this much sooner inshallah. Your subscription will help us to produce a lot more much-needed content for our children. Animation films are very expensive to produce and without your support, we will not be able to produce high-quality animation films for our children. Your 15c a day gives you access to hundreds of videos which you can view or download anytime anywhere inshallah. We are always working very hard to produce and upload new content for your children. May Allah reward you with the highest of Jannah for your support! Tailoring your email response is a simple way to connect with your audience from day one. For other tips on engaging with your customers be sure to read our other best practice guides.